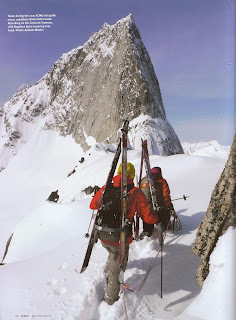 A photo from the latest Kootenay Mountain Culture that I took during the 2011 ACMG Ski Guide Exam. This was taken from the Crescent Traverse. The prominent ridge in the background is the NE Ridge of Bugaboo Spire. I was lucky enough to be working in the area all winter and have been doing so every winter since. Not a bad place to work!